please call our wildlife hotline at 780-914-4118. Have a wildlife concern? Take a look at the information below and follow the recommended steps. For more information and clarification call our Wildlife Hotline directly at 780-914-4118. If we do not answer live, please leave us a voicemail — we deal with over 8,000 phone calls each year; 6,000 of which are coming in between May and August. Thank you for your concern for wildlife! I have found a wild animal that I am concerned about, what do I do? If you have found injured, orphaned, or contaminated wildlife, please call our Wildlife Hotline at 780-914-4118. Your call is very important to us. When you call, you may have to leave a voicemail message. Please be patient as we deal with the animals currently in our care, or other phone calls. We will get back to you as soon as possible. Is the animal injured or orphaned, or are you seeing natural behaviours? If the animal is obviously injured (visible blood or dangling limb), or if you know for certain that it is orphaned; and if you are comfortable doing so, you may rescue (collect) small animals and birds that are injured or orphaned. Please follow the instructions provided by WILDNorth hotline staff to protect yourself and the animal. It is extremely important that once you have collected a wild animal you arrange to bring it to WILDNorth. If you cannot make it to one of our facilities please bring to one of our participating vet clinics as soon as possible. We intake wildlife at our Wildlife Hospital. If possible, please transport wildlife to this location, and not to the Wildlife Rehabilitation Centre. If you need to admit wildlife outside of our hours, please see our list of Participating Veterinary Clinics that will accept wildlife on our behalf. *Do not attempt to rehabilitate or raise wildlife on your own. Most wild animals are protected by law, and having them in captivity without a special permit could result in prosecution. A bird just hit my window, what do I do? The most important thing to do for a bird which has flown into a window is to protect it from predators (namely cats and dogs) by collecting it and placing it in a cardboard box that has a lid and ventilation holes. Keep it warm to conserve energy and keep it in a dark, quiet place so its brain is not trying to process excess stimulation. Usually, after an hour in a box the bird will recover and begin to move around, at this point it is likely ready to be released. Take the box outside before lifting the lid. If, after a few hours, the bird does not appear to be alert or if any swelling of the head or bleeding of the mouth is evident, we ask that you please call our wildlife hotline at 780-914-4118. * Please do not attempt to give the bird food or water initially; if it is suffering from head trauma its swallowing reflexes may not be functioning normally and it could choke on whatever you try to give it. ** In the spring, male robins are notorious for flying repeatedly into windows. They see their own reflection and interpret that as a rival male bird in their territory. They attack in the attempt to make it go away and often people view this as the bird attempting to get into the house. Usually, this behavior only lasts for a couple of weeks in the spring. Ensure bird feeders are either very close, or very far from windows. Hanging sun-catchers or window decorations to break up the reflection of the window. Hanging survey tape or streamers to the outside of the window. These move easily in the wind to break up reflections. Using a hawk outline that a WILDNorth volunteer has made, which can be found here. Window Alert stickers or Collidescape (or other reflective window coverings) can be purchased at several local stores like Wild Birds Unlimitedor Wildbird General Store. If the above methods are unsuccessful, you may resort to attaching fine screening to the outside of the window for the birds to ‘bounce’ off of. If you have any further questions, please do not hesitate to call our wildlife hotline at 780-914-4118. What types of wildlife can be brought to WILDNorth? I am concerned about Canada Geese during the nesting season. What should I do? 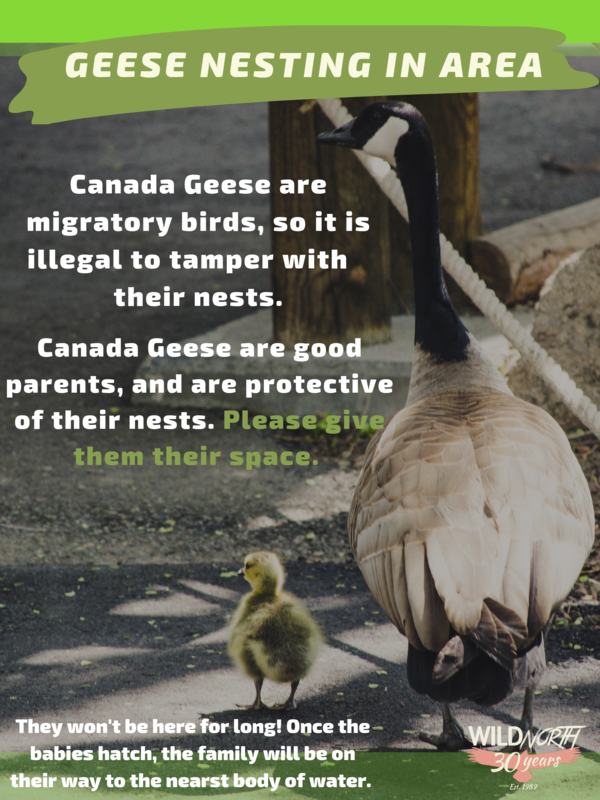 It is normal for Canada Geese to nest on or near construction sites, rooftops, balconies, parking lots, decks, yards, walkways, and other types of human built structures. Canada Geese are protected under the Migratory Bird Act, and it is illegal to tamper with a nest once it is made. The best way to avoid conflict with Canada Goose nests is to discourage geese from nesting in these areas. Once you notice a goose or pair of geese scouting out an inappropriate area, please call our Wildlife Hotline (780-914-4118) for advice on how to discourage them from nesting. Canada Geese have adapted well to urban environments, and they are quite common within the City of Edmonton. Canada Geese begin scouting out nesting sites in March. They often nest far from water and will nest on the ground or in elevated nesting sites (tops of hay bales, man-made nesting structures, balconies or roof tops). Once they have selected a site, the female will lay one egg a day. They can lay up to 12 eggs. The mother goose will begin to incubate the eggs. It then takes about 25-30 days for the chicks to hatch. Once the chicks hatch, the mother will brood them for a day or two. After the first few days, the chicks will follow their parents on foot and leave the nest site. The adult geese know where a water source is, and will gradually lead the chicks to the water source. The adults protect their young with usually one adult in the lead and one adult behind the chicks. If the nest is above ground, the parents will fly down to the ground and begin calling to their goslings, encouraging them to jump down and join them. Please note: Canada Geese have been known to nest in high up areas, away from predators. Goslings are very hardy creatures, and can withstand quite a long drop. To download an poster about nesting Canada Geese, click here. For more information about Canada Geese, click here. For more information about Migratory Birds, click here. I am concerned about White-tailed Prairie Hares (Jackrabbits) during breeding season (March-September). What should I do? If you find a baby hare, leave it right there! White-tailed Prairie Hares (aka Jackrabbits) are born fully furred with their eyes open. Hares are born March through September. New-born hares are able to hop around shortly after birth; they do NOT grow up in a nest. Hares are more active at night. The female can find her young at night to nurse them and teach them survival skills. Many people who find small hares alone during the day think they are orphaned. This is generally not the case. The mother hare leaves her babies alone so as not to attract predators to them. New-born hares stay very still when approached during the day. This is a normal survival strategy. At night, they become much more active and will run, jump and vocalize. Do not pick it up! Baby hares do not do well in captivity. They are prey species (an animal that is eaten by other animals) and are highly prone to stress when captured. It is always better for these babies to be left in their normal surroundings. If you find a baby hare, leave it right there! If you have already collected the baby hare and are wondering what to do with it, please put it back where you found it. Gently rub the baby hare with some grass or leaves to mask the human scent you’ve left on it. Doing this will help protect the baby hare from predators such as cats and dogs that are attracted to human scent. The mother WILL NOT reject the baby if it smells like humans. If you have found a baby hare that is truly orphaned or has an obvious and potentially life-threatening injury, please call our Wildlife Hotline at 780-914-4118. To download an informative poster about baby hares, click here. How do I properly capture and transport an animal to your shelter? Animals respond to capture with “flight, fight or freeze”. This means that initially they try to escape, if possible, and younger animals will “freeze” in order to avoid detection. Fight response can include bawling, screaming, pecking, scratching, clawing, biting, and flapping of wings. Have an appropriate container ready. Protect yourself by wearing thick gloves, such as leather gloves. Do not put your face near the animal. Use a towel/blanket/sheet to throw over the animal and then gently pick it up and place it in to the appropriate container. Cardboard boxes work the best for most birds except Ravens (they are able to pierce the box with their beaks). Plastic cat carriers also work but larger birds can damage their wing and tail feathers by getting them caught in the ventilation holes. Covering the holes with box board will help. These carriers work well for most small mammals except squirrels, who can chew their way through the plastic. Porcupines can be transported in plastic totes or metal/plastic garbage cans with ventilation holes. Wire cages are not recommended for most animals as they can easily damage their feathers against the wire. Containers should have a tangle free material (sheet, towel, paper towel) on the bottom to prevent the animal from sliding around during transport and the container should be large enough to allow for good ventilation. Small holes can be made in the cardboard box prior to placing the animal inside. Water and food dishes should be removed when transporting. If you have any questions, please do not hesitate to call our wildlife hotline at 780-914-4118. My pet caught a wild animal, what should I do? If your cat or dog has caught a wild animal, please attempt to capture it and bring the animal to our Wildlife Hospital. Even if you do not see any obvious injuries, wildlife caught by a cat or a dog often need to be put on a round of antibiotics. See “What types of wildlife can be brought to WILDNorth?” and “How do I properly capture and transport an animal to your shelter?” above for further advice. Did you know cats are the leading cause of death for songbirds in North America? For more information about this issue and how you can help, see Cats and Birds.